Exterior view of the 1800 Massachusetts Avenue NW building in Washington, DC. The1800 Massachusetts Avenue NW building vegetated green roof. Washington, D.C., December 10, 2012 /3BL Media/ – Service Employees International Union headquarters (SEIU), located at 1800 Massachusetts Avenue, NW in Washington, DC, has earned Leadership in Energy and Environmental Design for Existing Buildings (LEED-EB) Platinum Certification. In 2007, the building was awarded LEED for New Construction (NC) v2.1 Gold Certification. The 1800 Massachusetts Avenue building was developed in 1979 with a major renovation in 2006 and is currently managed by Akridge. Leonardo Academy was the LEED consultant supporting the successful achievement of Platinum Certification. This certification recognizes that 1800 Massachusetts Avenue, NW has implemented continuous sustainability improvement measures guided by the Leadership in Energy and Environmental Design for Existing Buildings: Operations and Maintenance (LEED-EB: O&M) v2009, a rating system developed by the U.S. Green Building Council. Added an onsite composting station for all landscape waste. Upgraded elevator electrical distribution system and lights to reduce annual energy use by approximately 43,000 kWh. This is equivalent to the average energy consumption of 3.5 homes. Diverted 100% of the electronic equipment solid waste from the landfill as part of a comprehensive recycling program. Achieved an ENERGY STAR rating of 89 out of a possible 100 points. The 1800 Massachusetts Avenue building has earned the ENERGY STAR Label five times. Reduced annual emissions by 3,199 metric tons of carbon dioxide equivalent through Leonardo Academy’s Cleaner & Greener® Program. This is the equivalent of removing more than 627 cars from the road annually. Developed multiple outreach efforts to educate and motivate building occupants to adopt sustainable practices. Documented a remarkable 84% reduction in single occupant commuting trips. Recycled 50% of the daily ongoing waste stream. 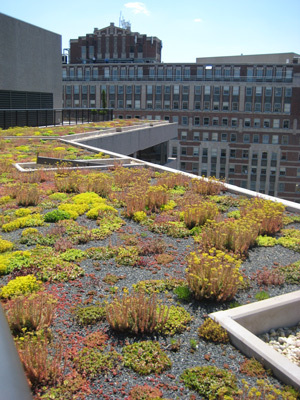 Maintained a native and adaptive 12,000 square foot green roof. Reduced indoor water use consumption by 31% through the use of low flow plumbing fixtures and hardware, compared to a traditional building. Akridge is a comprehensive real estate services company that provides acquisition, development, construction management, asset management, property management, leasing, and consulting services. Founded in 1974, the company has acquired or developed more than 12 million square feet of commercial space and currently manages four million square feet throughout the DC area. The industry's foremost benchmarking firm, CEL & Associates, has ranked Akridge the number one real estate firm in the country for Client satisfaction, among firms of similar size, ten times since 1999. Akridge launched "Building Sustainability" to provide a framework for sustainable development and operations, and has been recognized as an Energy Star Top Performer and Partner of the Year. The company has also been honored with the National Capital Business Ethics Award, and has been recognized as the Best Place to Work in Greater Washington by the Washington Business journal. For more information, please visit www.akridge.com. Leonardo Academy is a charitable 501(c)(3) nonprofit organization dedicated to advancing sustainability by leveraging innovative tools and information to motivate the competitive market Leonardo Academy works on a broad range of sustainability issues. Our programs and services include: organizational sustainability assessments and implementation; emissions footprints and reduction and offset strategies; sustainable event certification through our Cleaner and Greener® Program; LEED® assessments, implementation and certification application preparation; sustainable land management; sustainability training; and sustainability standards development. Leonardo Academy has provided LEED for Existing Building certification consulting services for over 23 million square feet of property worldwide. For more Information about Leonardo Academy visit http://www.leonardoacademy.org/.